L' Africaine, grand opera in 5 acts: Mi batte il cor... O paradiso! Ambroise Thomas; Amilcare Ponchielli; Bedrich Smetana; Carl Leopold Sjöberg; Carl Maria von Weber; Carrie Jacobs-Bond;... Very Good. In very good packaging. 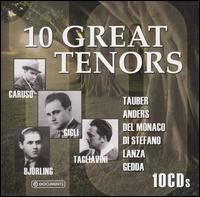 Various Artists-10 Great Tenors by Various Artists.